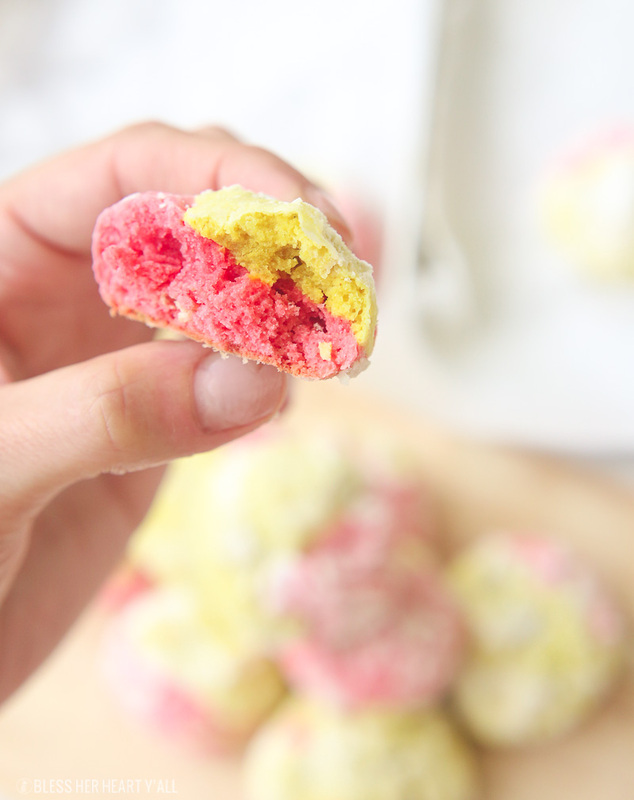 10-Minute Strawberry Lemonade Crinkle Cookies: Gluten-Free & Delicious! This strawberry lemonade crinkle cookies recipe combines zesty lemon flavors with sweet strawberry hints in a soft and fluffy crinkle cookie! These moist gluten free cookies are a great little snack or dessert all summer long! Strawberry lemonade crinkle cookies came about partly because of my Lemon Crinkle Cookies that were a big hit this past spring. 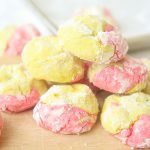 Not only are these strawberry lemonade crinkle cookies similar in soft and fluffiness to their lemon counterpart and they are just as easy to make! I use lemon juice as well as both lemon extract and strawberry extracts to get to the final strawberry lemonade flavor that each cookie is packed with. 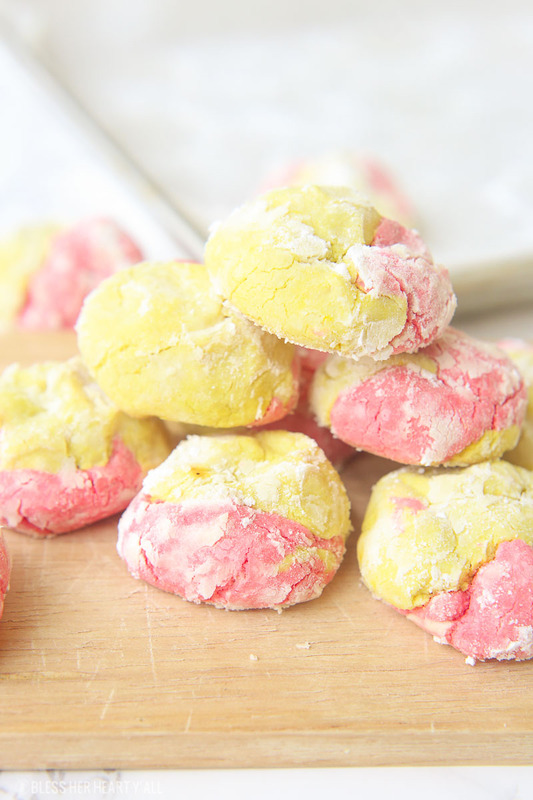 There is also the option to use red and yellow food coloring to get this bright and fun pink and yellow cookie coloring. This is completely optional and the strawberry lemonade taste is going to be there whether you choose to add in food coloring or not. Of course these gluten free crinkle cookies have the crinkles and cracks just like they should. What they don’t have is crumbly coarse texture like a lot of gluten-free baked goods have. 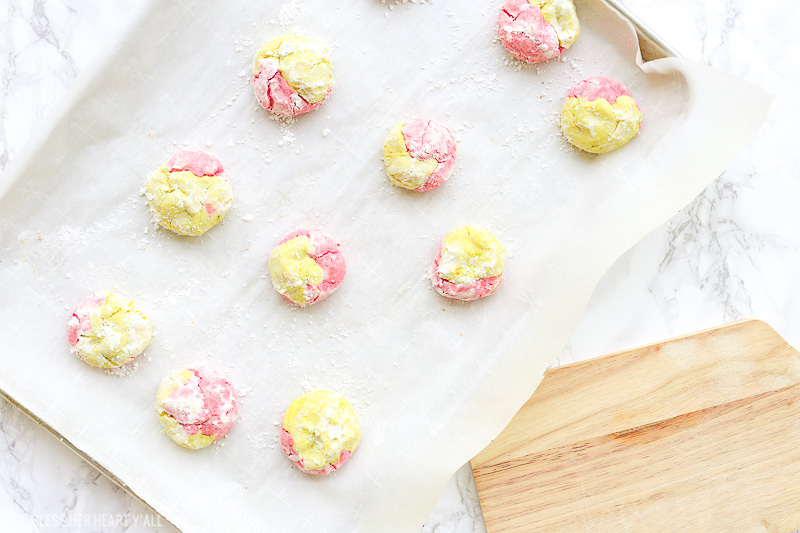 I will list off some ingredients below the recipe that I recommend using so that your strawberry lemonade crinkle cookies come out of the oven just like mine, soft and moist! The powdered sugar tops are just an option too. You don’t have to roll the cookies in powdered sugar…. …but why not? It’s a crinkle cookie….. roll it in more sugar. Preheat your oven to 350*F. In a large mixing bowl combine all wet ingredients (except the food colorings) together until well combined. In a medium mixing bowl combine all dry ingredients EXCEPT for the powdered sugar together until well combined. Slowly add the dry ingredients to the wet ingredients. Stir until completely combined and a smooth dough forms. 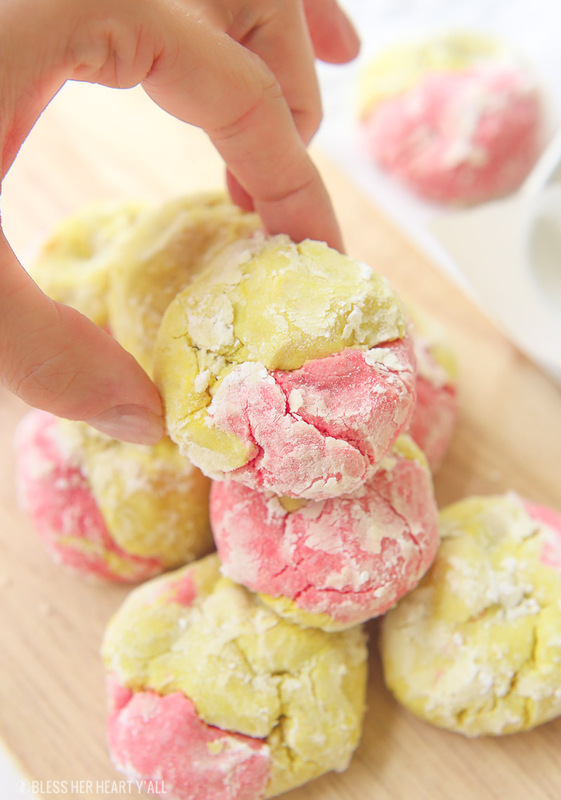 Divide the dough into two even amounts and add food coloring to each half to get the desired pink and yellow colors. 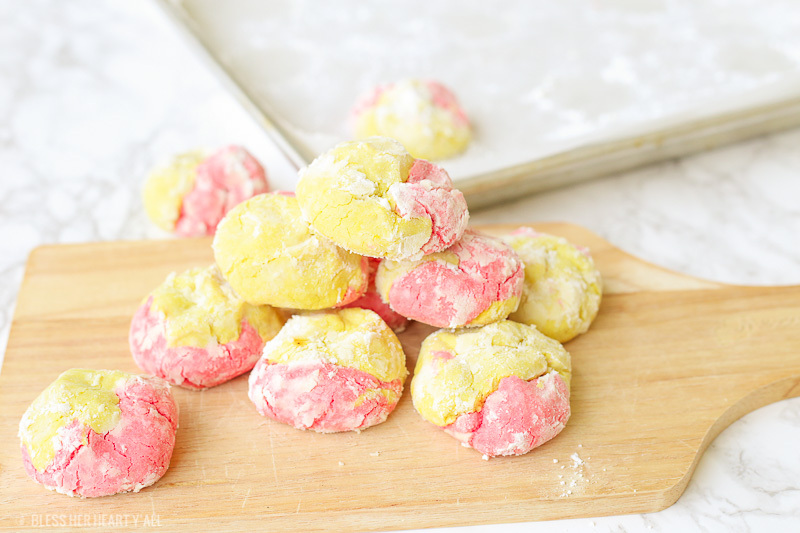 Roll dough into golf ball-sized balls (using part of the pink dough and part of the yellow dough) and then roll them into a small bowl filled with the powdered sugar. Coat each ball on all sides with the powdered sugar. Place the cookie dough balls on a parchment paper lined baking sheet 2-3 inches apart and bake for 8-12 minutes or until the cookies are crinkled on the tops. Remove from the oven to cool briefly on the cookie sheet before carefully being moved to a cooling rack to finish cooling. Enjoy! As it was explained above, the food coloring is an optional step in the recipe. 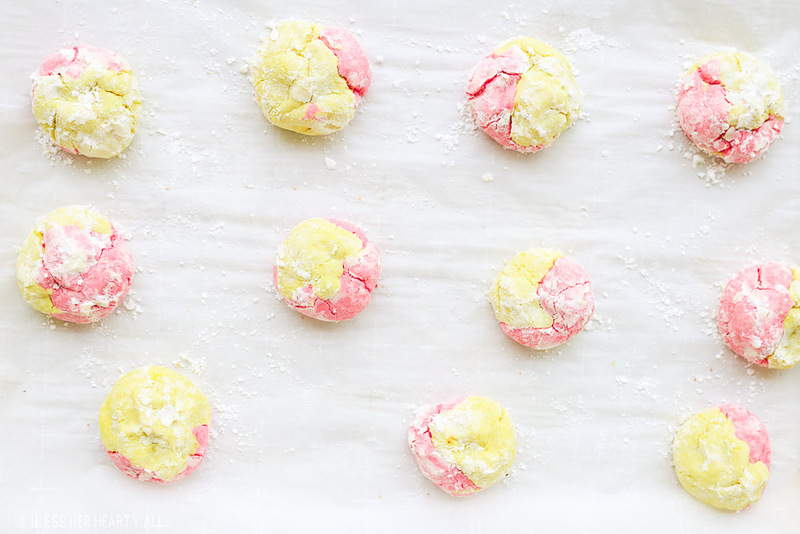 Rolling each ball of strawberry lemonade cookie dough into powdered sugar is also optional but does give it a little touch more sweetness…. plus it looks pretty. Use parchment paper underneath your cookies so that there are no troubles getting the cookies off your baking sheet. Oven times may vary but don’t overcook your cookies. Your strawberry lemonade crinkle cookies should still be fairly soft in the center when you take them out of the oven. Overcooking your cookies will lead to hard crunchy hockey puck cookies. I highly recommend this gluten-free flour for this recipe. My cookies come out perfectly every time and I don’t need to add in extra ingredients like xanthan gum to make my cookies legit. I use this strawberry extract. It gives off the right amount of sweetness and the perfect amount of strawberry flavor.